LOCATION: Skookumchuck, B.C., 54 km (33.5 mi) north of Cranbrook, 80 km (50 mi) south of Invermere. DIRECTIONS: Not really a community, Skookumchuck Prairie is described as a “locality” in the East Kootenays along Highway 93/95 where the Lussier and Skookumchuck Rivers join the Kootenay River. It is nearest place on the map to the acreage where prolific self-publisher Adolf Hungry Wolf has lived since 1973 at his Good Medicine Ranch. Gold was discovered on Skoo Kum Chuck Creek around 1864, resulting in sparse settlement since. After more than fifty titles since 1969, Adolf Hungry Wolf of Skookumchuk, born of Swiss and Hungarian parents, is easily one of B.C.’s most unusual and prolific self-publishers. His many Aboriginal titles culminated in a massive, four-volume history of the Blackfeet, entitled The Blackfoot Papers (2006), and his appetite for travel and railroading, after twelve visits to Cuba, resulted in a remarkable pictorial overview of vintage railroads in Cuba, Vintage Cubano (Canadian Caboose Press / Hayden Consulting $75 U.S.). Vintage Cubano contains more than 1,000 images of most American-built trains and autos from the 1920s, ’30s, ’40s and ’50s. With this volume in 2012, the author altered the spelling of Hungry Wolf to Hungrywolf. Born as Adolf Gutohrlein in southern Germany in 1944, to a Swiss father, also named Adolf, and a Hungarian mother, he never met his grandparents. At age ten he moved with his parents to California. With earnings from his paper route, he bought a plot of land in the mountains and began listening to the stories of an elderly Indian couple. He jettisoned plans to become a lawyer and began studying Aboriginal history at university, visiting tribes in the U.S. and Alberta. His first publication about railroading appeared in 1964; his first book about back-to-the-land spirituality, in 1969, marked the beginning of his Good Medicine imprint and his immersion in Aboriginal culture. 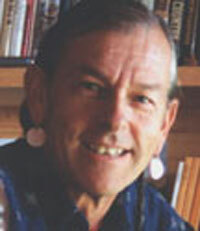 He began dressing in moccasins and braiding his hair. While eating stew with an Indian family one night, someone remarked he ate like a hungry wolf. He legally changed his name to Adolf Hungry Wolf. 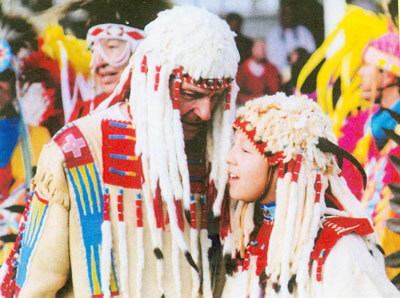 At a Blackfoot powwow in Montana he met Beverly Little Bear, from the Blood Reserve near Fort McLeod, who had been attending college in Lethbridge, Alberta. They married a year later and spent two years in an old log home on the Blood Reserve, near the home of her parents. “I soon realized he knew a great deal more about my heritage than I did,” Beverly Hungry Wolf once wrote. The couple moved to British Columbia to live at their Good Medicine Ranch at Skookumchuck Prairie in 1973. As their four children were added to their family (Wolf, Okan, Iniskim and Star), he obtained a 1922 CPR caboose to serve as his office and publishing headquarters. He assembled a massive archive of 20,000 photos pertaining to Blackfoot culture and continues writing and publishing his own books at a remarkable pace. Their children took correspondence courses and helped in the mail order operations of Good Medicine Books and Canadian Caboose Press. Their acreage became home to the Rocky Mountain Freight Train Museum, consisting of four cabooses and five vintage boxcars. Hungry Wolf and his son Okan developed a series of railway videos. Some of his titles have been re-issued by large publishing houses, including Warner Books, Harper & Row, Verlag Sauerlander of Switzerland, Hernov of Copenhagen, Sherz of Munich, etc. In the 1990s his trips to Cuba resulted in a series of titles about Cuba and its railways. Beverly Hungry Wolf left Skookumchuck in 1996 when their youngest child, Star, also left home. The couple later divorced. His books include Good Medicine: Life in Harmony with Nature (1969), Legends told by the Old People (1972), The Blood People: A division of the Blackfoot Confederacy: An Illustrated Interpretation of the Old Ways (1977), Blackfoot Craftworker’s Book (1977), Rails in the Canadian Rockies (1979), Canadian Railway Scenes, No. 1 (1983), Shadows of the Buffalo: A Family Odyssey Among the Indians (1983), Shadows of the Buffalo (1985), Children of the Sun: Stories by and About Indian Kids (1988), Canadian Railway Scenes (1988), Canadian Sunset: A Farewell Look at America’s Last Great Train (1991), A Good Medicine Collection: Life in Harmony With Nature (1991), Tradition Dress: Knowledge and Methods of Old-Time Clothings (1991), Canadian Railway Scenes (1991), Blackfoot Craftworker’s Book (1991), Indian Tribes of the Northern Rockies (1991) and Trains of Cuba: Steam Diesel and Electric a Guide Book With Photos Maps Rosters and Detailed (1997). Fifteen of Adolf Hungrywolf’s approximately fifty books are about railroading, including Vintage Cubano: Adventures with Old Cars, Antique Trains, and Friendly People (Hayden Consulting $60 U.S.), a retrospective gathered from 1993 to 2005 when he spent 18 months in Cuba. He recorded hundreds of narrow-and standard-gauge locomotives and countless old American cars for a 320-page, all-colour book. Hungrywolf took his first photo of Canadian railroading in 1963, at age nineteen, of a steam locomotive having its tender filled from a wooden water tank along a forest branchline on Vancouver Island. Since then he’s taken thousands of photos of Canadian railroading, and gathered thousands more, dating back to the 1870s. He intends to produce a cross-Canada magnum opus on railroading called Vintage Canadian, showcasing 600 colour slides and 800 b&w photos. “Good Medicine is the theme of my life,” he once wrote. Adolf Hungry Wolf and his son Cashius Klay. Good Medicine: Life in Harmony with Nature (Good Medicine Books, 1969). Good Medicine Traditional Dress Issue: Knowledge and Methods of Old-Time Clothings (Golden: Good Medicine Books, 1971). Legends Told by the Old People (Good Medicine Books, 1972). Rails in the Canadian Rockies (Good Medicine Books, Invermere, B.C. 1979; Skookumchuck, BC: Canadian Caboose Press, 1993). Literary loner Adolf Hungry Wolf, 52, is a classic B.C. backwoods do-it-yourselfer. From his 1922 CPR caboose number 436788, about 20 minutes north of Skookumchuck and 50 kilometres from Cranbrook, on a grassy meadow overlooking the Kootenay River, without electricity or a telephone, working by the light of a kerosene lamp, the California-educated railway buff and Blackfoot Confederacy spiritualist has created more than 50 books. Translated into four other languages, he’s one of Canada’s most prolific self-supporting authors. But if you’ve never heard of him, you’re hardly alone. Adolf Hungry Wolf isn’t famous for two good reasons. Having married a Blackfoot Indian from the Blood Reserve near Fort McLeod, he avoids seeking publicity in deference to teachings they’ve received from Native elders. “I feel free to go along with p.r. when it comes my way,” Hungry Wolf says, “but not to actively seek it out.” Hungry Wolf is also leery of those who would denigrate his beliefs. Once stung by a reporter at the Frankfurt Book Fair who dubbed him a ‘Teutonic Grey Owl’, he has been the subject of a ‘wanted poster’ circulated by a militant Native group in the 1970s and more recently he’s been called a ‘plastic shaman’ by Greg Young-ing of Penticton. In 1996, Beverly Hungry Wolf, who has been designing and teaching a new Native language course at Blackfeet Community College in Browning, Montana, published a sequel to her bestseller, The Ways of My Grandmothers, called Daughters of the Buffalo Women: Maintaining the Tribal Faith (Canadian Caboose Press $14.95). Also in 1996, AHW released his 50th book, Mountain Home: Tales of Seeking a Family Life in Harmony with Nature (Canadian Caboose $14.95), along with two new books based on his recent trips to Cuba, Trains of Cuba: Steam – Diesel & Electric (Canadian Caboose $16.95) and Letters From Cuba; Simple Living with Vintage Cars, Old Trains and Friendly People (Canadian Caboose $17.95). BCBW sought out Adolf Hungry Wolf in July of 1997. Adolf Hungry Wolf was born Adolf Gutohrlein [meaning ‘Good Little Ear’] in southern Germany in 1944 to a Swiss father and a Hungarian mother. “I grew up without any sort of personal roots,” he says. “My parents lived in a foreign country and I never met my grandparents.” One grandfather had been a railway man; his father loved the Alps; and like many boys raised in the devastation of post-war Germany, ‘AHW’ romanticized the life of North American Indians. His writing career would incorporate all three influences. At age ten, in 1954, he moved with his parents to southern California. Having Adolf as a first name, as a German immigrant, didn’t exactly help matters. Four years later, mostly with his paper route earnings, he bought a small parcel of remote mountainous land and began listening to the stories of an elderly Indian couple and befriending a park ranger. While studying Native history at university he also visited tribes in the U.S. and Alberta, meeting the likes of Jim ‘Last Gun’ White Calf, the last surviving Blackfoot buffalo hunter. In 1969 he published his first spirituality booklet, with hand-lettered captions, called Life in Harmony with Nature, which has been through 12 printings. A self-appointed acolyte, Adolf began dressing in moccasins and braiding his hair. While eating stew one night with an Indian family, the wife mentioned he ate like a hungry wolf — and the name stuck. Legally, he became Adolf Hungry Wolf but he was still an outsider. Beverly Little Bear changed all that. Little Bear had left the Blood Reserve to attend college in Lethbridge. Accompanying her brother to a Blackfoot powwow in Montana, Beverly Little Bear was intrigued to see a white man listening intently to Indian elders. “I soon realized he knew a great deal more about my heritage than I did,” she says. That night, at the Montana powwow, when she talked at length with the strange Californian with the German name, Beverly Little Bear was inspired by his hopes and plans to revive tribal culture. They married a year later and spent two years in an old log house on the Blood Reserve, near the home of Beverly’s parents. They moved to Good Medicine Ranch at Skookumchuck Prairie in 1973. “Good Medicine is the theme of my life,” he says. With the arrival of children, AHW obtained a 1922 CPR caboose for his office. Beverly, who also writes and edits books, subsequently acquired her own caboose. In 1975, as described in Equinox, the couple became involved in an historic event that brought back to the Blood Tribe its its ancient and revered Longtime Medicine Pipe Bundle. Adolf Hungry Wolf dreamed that a Blackfoot elder named Many-Gray-Horses was conducting a strange ceremony on the lawn of the Provincial Museum of Alberta. This museum had previously purchased the bundle for $3,000. Inspired by this dream, Many-Gray-Horses and his wife drove with Beverly and Adolf Hungry Wolf to the museum and walked away with the bundle. This ‘retrieval’ of the medicine bundle helped spark a revival of Blackfoot beliefs. Hungry Wolf has since been initiated into the Brave Dog warrior society and his family has been entrusted with two medicine bundles. As well, the Hungry Wolfs have assembled some 20,000 photographs and archival images of Blackfoot culture, including nearly 4,000 from the 1800s and early 1900s, all currently locked in a fireproof vault. They hope to one day publish an exhaustive pictorial history of all four divisions of the Blackfoot Confederacy. The couple have also raised four fully grown children — three sons, Wolf, Okan, Iniskim; and a daughter, Star. All were taught school by correspondence; and all were taught to respect nature. With herds of elk grazing on the property, the Hungry Wolfs will delay early morning trips to the outhouse until the various animals move back into the trees. The children were also taught prayers at mealtimes and are learning the Blackfoot ceremonies to mark the passing of each season. Over the years the whole family has helped to fulfill mail order book orders for Good Medicine Books and Canadian Caboose Press from the family’s caboose warehouse. Okan Hungry Wolf, now 24, has provided book illustrations, produced a series of railway cards, developed a series of railway videos and has accompanied his father and his brother Iniskim on research trips. “Most of my books have been slow but steady sellers,” says Hungry Wolf. “They’ve been just enough to support my family in our simple lifestyle. I don’t think the business would have survived these past 28 years had we been in Toronto or Vancouver. The Hungry Wolf acreage includes four cabooses and five vintage boxcars, a collection which constitutes the Rocky Mountain Freight Train Museum. Usually not open to the public, it’s operated by the family-controlled Good Medicine Cultural Foundation and Historical Society. As a lifelong railway buff, AHW released the first of his many books in 1964, Rayonier, Inc.: Railroading in the Northwest Pines (Trans-Anglo Books, Los Angeles), a project he began as a high school student at age 16. Although he hasn’t lived in his caboose since 1991, Hungry Wolf continues to avidly conduct research as one of the world’s foremost experts on old trains, having most recently made several forays to Cuba. 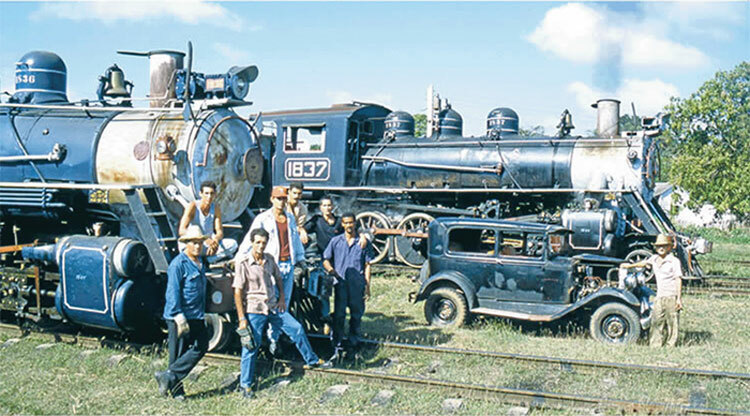 Cuba has the world’s biggest assortment of operational American-made steam locomotives, making Cuba a Mecca for train worshippers. Railway afficionados will appreciate Hungry Wolf’s newly published guide to 331 steam engines for 63 sugar mills; 76 of which are operating on narrow gauge rails. Engines include an 1878 Baldwin 0-4-2T and a 1925 Alco-Cooke Mikado. “This is the book I wish I could have had for my first visit to Cuba in 1993,” he says. Ostensibly a series of holiday letters sent to friends and family, Letters is an off-the-beaten-track travelogue that mixes history and cultural observations with informal encounters and humorous asides. Adolf Hungry Wolf and his sons were warmly welcomed by rural Cubans who appreciated their fascination with antiquated machinery as well as their compatible attitudes towards community. While he is sometimes critical of the Cuban government, he is far more distressed by current American policies, such as the Helms-Burton Law. “America has seen fit to expand ties with communist China which is more totalitarian than Cuba,” he writes. 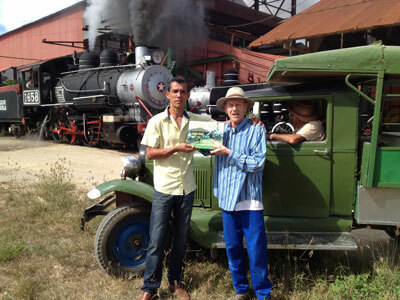 To express his camaraderie with the Cubans, Hungry Wolf acquired written permission from the Cuban Embassy in Ottawa to bring 40 copies of Letters and 32 copies of Trains to present to the people he has written about. This spring he returned to Cuba for a fifth time to make the deliveries. “Imagine the reaction of my friends when I handed them a brand new book with their picture inside — or, in the case of my adopted family — with their group portrait right on the front cover, in full colour. These are dirt poor peasants who’ve never been to Havana, much less seen the rest of the world. Cubans are eager to have their lives documented, unlike many contemporary Natives. If a financial backer can be found, Hungry Wolf’s next project will be a coffee table book celebrating Cuba and its people. Meanwhile he was able to attend a political rally and sit within 50 feet of Fidel Castro, taking pictures, and he realized a lifelong fantasy — to turn back the clock and work as a locomotive engineer on a narrow gauge railroad. Hungry Wolf’s love of old trains and old cars — which he says make Cuba’s streets resemble movie sets — is matched by his disinterest in newfangled computers. “I’m fascinated by the potentials of computers and things like CD-Rom but I have no interest whatsoever to get one of them or learn how to use them,” he says. “My Swiss father was a precision machinist who was always designing and making things. Maybe I got my drive from him. I’ve always got six or seven writing projects going. But whereas he was fascinated by technology, I’ve spent much of my life trying to live with little of it. Without electricity, Hungry Wolf relies on a pair of heavy Olympia manual typewriters for all his output, often keeping a big pot of stew simmering on the wood stove. He takes frequent breaks from writing, sometimes running in the woods with his dogs or riding his kayak through the backwaters of the Kootenay River. Other times he makes the six-kilometre round trip on his mountain bike over an old logging road that connects his homestead to the nearest highway. It’s a frugal life, rich in nature. Part of the year he bathes in the Kootenay River; the rest of the year he heats buckets of crystal clear mountain water on the stove, raised from a well by an always-reliable hand pump. Daughters 0-920698-56-5; Home 0-920698-54-9; Trains of Cuba 0-920698-46-8; Letters from Cuba 0-920698-52-2. These Canadian Caboose Press books are distributed in Canada by Heritage House. KIMBERLEY–One of Canada’s most prolific but least known authors lives in a caboose and works by the glow of kerosene lanterns. He’s Adolph Hungry Wolf, a Swiss-born, California schooled, adopted-Blackfoot Canadian. On his family’s Skookumchuck Prairie homestead, 30 miles north of Kimberley, Hungry Wolf’s only concession to the modern world is a 12 volt battery to power a radio. Without the distractions of electricity or running water he has nonetheless produced 40 titles for prestigious international publishers such as William Morrow and Harper & Row, and for his own company, Good Medicine Books (Box 844, Skookumchuck, B.C. VOB 2EO). “Good Medicine is the theme of my life,” he says. Hungry Wolf has been immersed in a profound spiritual growth for 20 years, spending thousands of hours with native elders, learning and recording their ways. Blackfoot culture is very complex but Hungry Wolf has become the keeper of one of the twelve major medicine bundles of the tribe. These bundles symbolize everything important in traditional life. He has also acquired some 20,000 photographs and archival images, including 4,000 from the 1880’s the present “showing virtually everybody and everything about the Blackfoot culture over the last 100 years.” His archival material and research are locked in a fire-proof vault and will eventually be published in an exhaustive pictorial history of all four divisions of the Blackfoot Confederacy. Adolph, with wife Beverly and children Wolf, Okan, Iniskim and Star, live on a grassy meadow overlooking the Kootenay River. Beverly teaches the children the required school curriculum at home in their cabin, while Adolph writes and sleeps in a restored caboose. The compound on their acreage includes four cabooses and three boxcars of the 1890’s to 1930 vintage. These, with an assortment of rails, running stock and railway artifacts comprise the private Rocky Mountain Freight Train Museum, not generally open to the public. The assets in the collection are held by the Good Medicine Cultural Foundation and Historical Society, controlled by the family and members. Hungry Wolf’s first of many books on railways, Rails in the Mother Lode (Darwin) was published in California and remains a classic among rail buffs. Selling out three hardcover printings, Darwin published a paperback reprint last fall. His next railway title, Off On a Wild Caboose Chase, a farewell tribute to the last of the cabooses in Canada, is expected in the fall of 1988. Although his interest in railways might seem to be antithetical to his abiding native way of life, Hungry Wolf has researched and written about railways with an almost equal consistency. After high school and during his university training for teaching in California, Hungry Wolf first worked as a locomotive fireman on trains. By the mid-seventies Hungry Wolf had issued his first Canadian Railway imprint, Rails in the Canadian Rockies. The hardbound edition is still in demand by railway enthusiasts who will pay $65 to $100 per copy at antiquarian or secondhand bookstores. Hungry Wolf is articulate and confident, but shies away from the limelight. He does not actively promote any of his titles. Once stung by a reporter at the Frankfurt Book Fair, who labelled him a “Teutonic Grey Owl,” for many years he refused all media interviews. More recently he has enjoyed thoughtful interviews on Morningside and other CBC variety programs. Hungry Wolf and his family lead a relatively uncompromising life. Friends have suggested that the acquisition of a word processor would considerably ease the physical tediousness of scribing new works, but Hungry Wolf has rejected all such suggestions. His attitude is not the frantic intensity of a Luddite condemning machines, but rather he seems mostly unconcerned with what goes on about him in the name of so-called progress. and filled with expanses of grasslands. Large herds of elk grace the property. In the morning, when the family first stirs, a trip to the outhouse is not permitted until the animals have moved back into the trees or the alpine. Hungry Wolf is also a dancer and singer, and a member of various Blackfoot societies with attendant ceremonial obligations. Prayers are said at mealtimes, and each passing season is heralded with special private or tribal events, many of which are not shared with the public or the uninitiated. Although dependent to an extent on mail order book sales from a caboose warehouse, the family lives beyond a locked gate on the highway and several miles down a winding road. They only come to town once every week or two, and during stormy winter months their road can be impassable for two weeks at a time. Hungry Wolf deals with a New York editor on his Morrow imprints, while the U.S. publisher leaves promotion to Macmillan. Macmillan features the Morrow imprints in Canada as agency titles from the New York office. These works are poorly promoted. Hungry Wolf’s house imprint, Good Medicine Books, is now available from Lone Pine Publishers in Edmonton. Sales in the early years were largely via word-of-mouth and from reviews in publications like the Whole Earth Catalogue and Mother Earth News, although the scope of his work soon out grew its roots in the back-to-the-land movement. In recent years Hungry Wolf and his son Okan have developed a series of one hour railway videos, and lately Adolph has produced a series of railway cards. Son Okan is now working on illustrations and line drawings to accompany future book projects such as Hungry Wolf’s forthcoming Indian Tribes of the Northern Rockies. Hungry Wolf’s Good Medicine Books has published nearly 20 titles, including a series of Canadian Railway Scenes, Canadian Railway Stories, a yearly railway scene calender (Raincoast distributors), and Indian titles such as the Blackfoot Craftworkers Book and Good Medicine Traditional Dress Issue. His own backlist titles in and out of print include Tipi Life, My Cree People and The Good Medicine Collection, an anthology culled from the first eight volumes in his series. A second Good Medicine anthology will encompass the best of volumes nine to 16. William Morrow (Macmillan in Canada) has three titles in print; Ways of My Grandmother, written by Beverly Hungry Wolf, Shadows of the Buffalo -A Family Odyssey Among the Indians, co-written with his wife, and Children of the Sun, stories by and about Indian children. BC BookWorld: Can you pinpoint where the process for The Blackfoot Papers (Good Medicine $300) began? Adolf Hungry Wolf: Right after high school, in 1962, I was at an estate auction of an anthropology teacher where everybody wanted pottery and furniture. Nobody bid against me for one box of old photos. There were a few hundred of them, mostly old scenes of the Blackfeet, though I didn’t know that at the time. There was hardly any info with the prints. I didn’t know much about the Blackfeet then. I didn’t have any plans to join them. I was making my second photo-history book on railroads. It occurred to me I might do something similar with these “Indian” photos but I never dreamed it would take me 44 years. I just figured I’d get as many of the images identified as possible. By the seventies, I realized it would have to be a very large and well-done book. I’m half Swiss. [Laughter] Precision and accuracy are in the genes! BCBW: Not to mention perseverance. AHW: Absolutely. All through the years I envisioned one book, but reality made me split it up. Four is our special number, ceremonially. So it became four volumes. And there are 400 numbered limited editions. There are 44 single volumes without numbers, which I’ve been giving to those who helped most, plus my family. The first three volumes explain the tribal history, culture, lore, dancing and ceremonies, etc. The fourth one contains the biographies. It’s the most popular so far. No surprise about that. BCBW: What are some of your best discoveries you’ve made over the years? AHW: The photos of people I’ve come to know personally. Photos from the early 1900s. Even the late 1800s in a few cases. I’m talking about elders, of course. Almost always they have never seen these photos of themselves. They were usually taken after someone came to a Sun Dance camp, a pow-wow, or whatever. They took some shots, then went back wherever they came from. A handful of these elders are still living. All of them got free books with their photos and stories. Every time I call them they seem to be browsing, reading, finding more stuff they never knew, photos they never saw before, and people they remember. BCBW: Do you see anybody doing similar work to what you’re doing? The American filmmaker Ken Burns, for instance? AHW: I’ve never heard of Ken Burns. I don’t see my work in relation to anybody else’s. I still don’t take much part in many book-related activities, except the Frankfurt Book Fair. And this interview. I rarely read books. I never think of myself as a loner, though that’s probably what I am. At least in regards to the literary world. BC BookWorld is about the only place I can think where I might feel I belong. BCBW: As the proverbial white guy doing Indian stuff, do you get more flak these days from First Nations intellectuals or from the Indianology academics? AHW: I don’t know and I don’t really care. My daughter Star says there have been enough hatchet jobs done over the years that I could do a book by just replying to them all. But that would be boring and useless. The last one was from some German professor. My eldest son and Star did get me to respond to some of the attacks in an upcoming autobiography, but that’s mostly so my grandkids will get to hear my side of the story. There were some assassination attempts back in the seventies, but I don’t have much dealings with the “Native intellectuals.” I don’t know what they think of me. I don’t care much. I lead a couple of the most important medicine bundle rituals for various traditional families within the Blackfoot Confederacy and I do care what those people think. BCBW: Some of your kids have started making books and films. Can you tell me about what they’re up to? And where they live? AHW: Star and her husband, who is a member of the Kootenay tribe, are now the keepers of the Thunder Medicine Pipe bundle that Beverly and I cared for 28 years. They live in Cranbrook, near his reserve. Right now she’s busy raising baby daughter Natanik, working for her husband’s tribe and immersed in her cultural duties. Star was the Sun Dance woman once, over ten years ago, and she was recently the “holy grandmother” for Sun Dance for the sixth time. She ran the woman’s part of the lengthy ritual, initiating the “holy woman” for the Sun Dance. BCBW: And what about Okan, your eldest son? AHW: He was just the “holy person” a few weeks back, for the fifth time, for a Sun Dance on the Blood Reserve. It’s the most traditional and conservative of the four Blackfoot divisions. Okan and his “holy partner” have vowed another Sun Dance for next summer, and he vowed to spend the year in-between riding his Spanish mustangs through traditional Blackfoot country, from the Red River to the Yellowstone, camping in his tipi. He normally lives in his great-grandma’s little cabin, without plumbing and electricity, on the Blood Reserve. As we’re talking, he is crossing the Rockies with five of his horses, three of them packed, from the Blood Reserve to our guiding camp which is next to Waterton National Park. He plans to document his journey with a video camera and he might try to do a book, as well. My other three kids respect our culture. They attend family ceremonies. But so far they are not leaders like those two. BCBW: You’ve worked all this time without funding, but you must have had some support along the way. AHW: The book designing was done over a two-year period with Diane Jefferson and her computer. And I have had a fantastic relationship with David Friesen at Friesen Printing in Manitoba. Without him, these books could not exist. I gave him every penny I owned in cash, which was about one-fifth of the total cost. David flew me to Winnipeg, showed me the plant, put me up. He introduced me to everyone there, then said he believed enough in my project to bring it out. He knows my debt-paying from doing business together for twenty-some years. So that’s it. It’s just Friesen’s and me. There is no advance announcement, no planned public relations. BCBW: Assembling that amount of material must have been equally daunting. AHW: I felt like the conductor of an orchestra. I knew what I wanted, and Diane knew how to put my wishes into the computer. We got uptight with each other a few times, but mostly it just flowed. I did all the writing on my solar-panel-powered IBook. I would have been crazy not to. But it’s packed away again. I’m back to the trusty old typewriter. After several visits to the Andes Mountains, prolific self-publisher and historian Adolf Hungrywolf, an adopted member of the Alberta-based Blackfoot First Nation, discovered many of the communities living there and learned of their traditional ways from shamans, both male and female. He is now looking for a publisher for his book about his South American experiences, Mystico: Life with the Mountain Spirits. The 311-page manuscript has over 100 photos, drawings and sketches of the Andean people and their environs. Here Hungrywolf describes what enticed him to travel so extensively among these mountain people. As a leader of traditional Blackfoot ceremonies and a constant wonderer of the Canadian Rocky Mountains, I had long yearned to visit the Andes of South America and meet some of the mountain people there. In 2007, I fulfilled my wish, spending two and a half months with descendants of the Incas who live in remote places of the region that is home to other famous sites such as Machu Picchu, Lake Titicaca, Cuzco and the Sacred Valley. Prior to embarking on my trip I had a dream that Wolf Old Man, one of my wise and elderly Blackfoot teachers from more than forty years before, appeared and advised me to seek a certain ‘mountain man’ when I reached my destination. He told me that I would receive something special from this mountain man. During the first month of my trip that goal was always in my mind but no one I met fit the description. Eventually I put the idea aside. No sooner had I done this when a young native taxi driver named Rolando Huallpa heard my story and offered to take me to his boyhood mountain home, an isolated slope at 12,000 feet, where he knew someone who fit my ‘mountain man’ description. That man turned out to be Bueno Venturo Hancco Quispe (his first two names mean ‘good venture’). As soon as I met him, Bueno Venturo broke into a big grin showing lips and brilliant white teeth stained with green coca plant juice. His dark eyes bored deeply into mine out of an equally dark face. He was wearing a vividly coloured poncho that covered his upper body and black homespun woollen pants that ended below his knees. The rest of his legs were bare, dark and muscular. I knew instantly that he was the one. Perhaps he felt the electricity of our meeting as well because he did something he hadn’t done with any outsider before in his fifty-some years of rugged mountain life and ritual studies: Bueno Venturo shared his ceremonies with me. We became adopted brothers after that – a custom as common among Venturo’s Quechua people as it is among the Blackfeet back home. My young taxi driver friend Rolando – whose own father was murdered along a trail when he was just a small boy – introduced me to everyone as his long lost ‘papa,’ while I explained that I had three grown sons his age back home in Canada who call me the same thing. I had further visits with Bueno Venturo and also with other shamans – men and women. All were people that Rolando and I reached by hiking over rugged trails in the mountains. At one point he nearly got me married to his widowed aunt Juliana, who lives with her sheep and llamas in an unheated hut at almost 14,000 feet. I continued to visit the Andes since that first journey. After my second trip I received word that by brother Venturo had been brutally murdered. So I went back for a third time to check out what had happened. I had also received invitations from other families living in remote and traditional Andean villages. They wanted me to join them for their annual ‘pukllay’ rituals, which are usually held in secret far from tourist places and during the inhospitable rainy season. I share these stories in my book as well as many comparisons between the Andean mountain people and the Rocky Mountain people where I live. I hope it will inspire some readers to venture off the popular Andean tourist trails to seek the wonderful spiritual guides who live in more remote areas.